Do you know Kompas newspaper? Gramedia Bookstore? Sonora Radio, or Bobo Child Magazine? If the answer is "yes", it mean you also know who the most important figure in the establishment of these companies, namely Jakob Oetama. Founder of Kompas Newspaper. 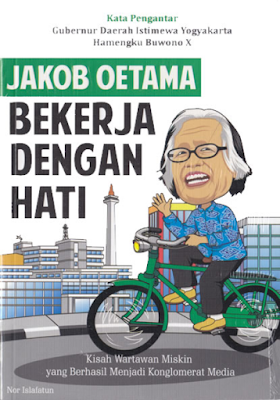 Jakob Oetama was born in Borobudur, Magelang, 27 September 1931, he was a journalist and co-founder of Kompas newspaper. Jakob is the son of a retired teacher in Sleman, Yogyakarta. After graduating from high school (Seminary) in Yogyakarta, he taught at SMP Mardiyuwana (Cipanas, West Java) and SMP Van Lith Jakarta. In 1955, he became editor of the Penabur weekly in Jakarta. Jakob then continued his studies at the Public University of Jakarta and the Faculty of Social Politics UGM Yogyakarta. Jakob's journalism career began when he became editor of the Sower Weekly of 1956. In April 1961, Ojong invited Jakob to create a new magazine called Digest, the essence of the development of world science and technology. The monthly magazine The first digest of August 1963. Together with P.K OJONG, Jacob Oetama in 1963 founded the essence magazine. The magazine is oriented to a US-reader's digest magazine. Further success stories essence followed by establishing a daily newspaper called KOMPAS. This happened in 1965, during which Indonesia was in the midst of a frenzy by the threat of revolt of the Indonesian Communist Party (PKI). From this Kompas development, then stand up business group KOMPAS GRAMEDIA. Gramedia is the name used to label members of the bookstore business. Until now the group of compass gramedia under the control of Jacob Oetama has expanded its wings in various business fields. Including managing the hotel business and also took part in the world of television journalism. In the realm of media, Jakob gait undoubtedly. In 2003, by Universitas Gajah Mada (UGM), he was awarded a Doctorate Honoris Causa to his consistency in developing the Indonesian press. In addition, he is also known as a successful and wealthy businessman. Jacob also active in various organizations at home and abroad. Some of them had been Secretary-General of the Indonesian Journalists Union (PWI), Members of the House of Representatives of the Press Group, Founders and Members of the Council of the Indonesian National News Agency, Members of the PWI Advisory Council, Federation Internationale Des Editeurs De Journaux (FIEJ) Members of the International Alumni Association East West Honolulu, Hawaii. (Read on page 33). This book not only invites you to recognize Jakob closer and whole. Moreover, this book tries to present the little secrets Jakob has in "getting around in life". 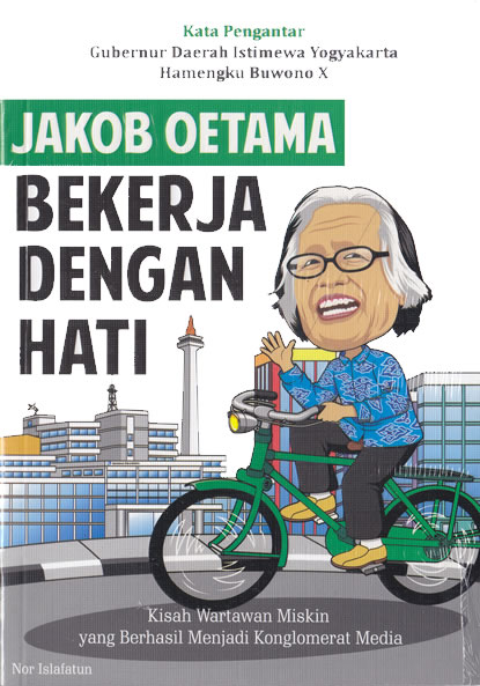 When opening the pages of this book, we are invited to explore a journey of life from a Jakob Oetama.